On the far left is a “Chex Cereal” branded cube. It’s not a a great cube because most squares are little fruit or cereal icons on a white background, which makes it a little more difficult to visually sort. It’s still an interesting and unique cube, though. On top is a gimmick cube in which you can place pegs as part of some convoluted game. I no longer have the pegs, so now it’s just a strange cube. It’s made from solid colored plastic (as opposed to solid black plastic with stickers) which gives it a surprisingly different feel. I like it. In the middle is my only real, original Rubik’s Cube. 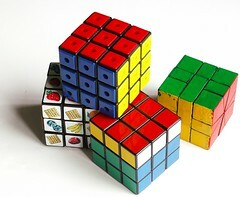 Sometime in 1991 I mentioned to someone that I knew how to solve them but I’d lost my cube, so I no longer owned one. They were no longer in stores (at least, not in any stores in my area) so I couldn’t get one. This guy challenged me, “You’ll never be able to solve mine. I’ve been messing with it for years and it’s never been solved.” He believed that the longer you mess with a cube the more “scrambled” it gets. This isn’t really true. Like shaking a jigsaw puzzle: messed up is messed up, and you can’t make it “extra” messed up by shaking it longer. So: I bet him $5 vs. his cube that I could solve it in under 5 mins. I did it in 2 and won the cube. This is what prompted me to start collecting this stuff in the first place. This was a great deal. $5 was about half the price of a new cube, and this one was in great shape and already loosened up. And just now as I type this I realize: This was the only time in my entire life I’ve ever bet anyone anything. I just never do it. It seems like a very agressive and pompus thing to do. In this case, I think I did it because I knew for a fact I would win (so it wasn’t really gambling) and because I didn’t have any other means for getting a Rubik’s cube. However, I still feel sort of like I took advantage of him by exploiting his lack of understanding of the thing. In my defense: He provoked me, and all but called me a liar. On the far right is some sort of shape-changing cube I picked up in the mid-90’s. It was junk. The concept is great, but the thing was stiff and difficult to turn. Instead of “loosening” like most cubes over time this thing became tighter, until it was a chore to play with. (Perhaps some axle inside rusted? I have no idea what would cause this.) The pressure from my hands forcing it to turn eventually stripped off the stickers, and so my wife painted it. It looks cool, but by now it has more or less siezed up and is unusuable. Yeah, I can (now) solve Rubic’s cube as well. I also had one of those cubes on the right, but mine loosened too far and fell apart (which, admittedly, was the only way I was able to solve it at the time…). I also have a Sudoku cube, with numbers 1 to 9 on the face. Unfortunately, it’s hard to solve due to being too similar looking (like the Chex Cereal one). I also have a cylindrical one, like the rubic one, but with the corners on four edges being flat (so that the shape looks like an octogon from the top). Solving it is exactly like Rubic. I had the Chex cereal cube as well. I wasn’t quite as fast as you, but I did read and learn the standard book method of solving cubes back when I was a kid, and took on all challenges at school to solve cubes. That was right when the cubes were really popular, and luckily for me, even after the Rubik’s popularity declined, I still had a lot of friends I met through the cube. i have a chex cube…………..never used…….still in original mailing box….Ralston Purina Co………Belleviev,Ill…………….what year did that get sent out i dont remember when i ordered it?